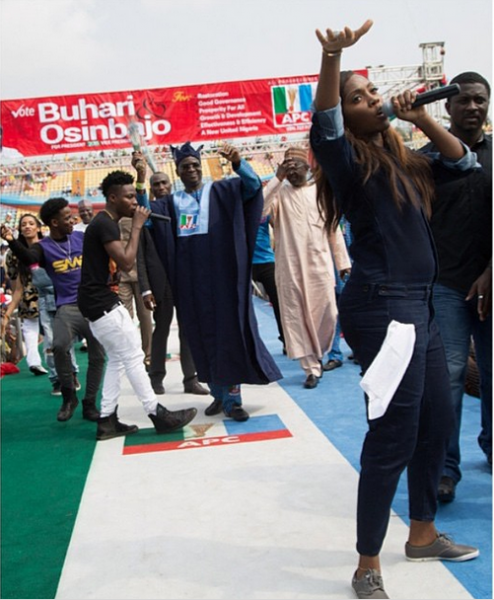 Tiwa Savage was spotted dancing shoki with her baby bump at the APC Rally in Lagos. Wow!! This lady is really rocking!! Just incase it makes Lalastic!! I guess she's enjoying herself now that she still can. When that bump becomes so big, she won't even be able to move 5 steps. U should no sey I no go open any link because of sum1 wey dey run mad for apc rally .... GEJ till 2019!!! Lalastic is FP since SEUN found Nairaland. Nigeria is supposed to have at least 1 million Oga Fash, how I wish that were possible. Our image for don shine by now. Tiwa is gonna give birth to a dancer.